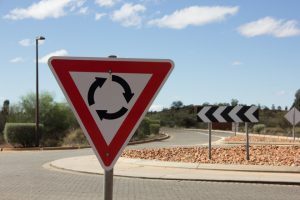 For those who are new to driving in Boston and the greater Boston area, rotaries can be among the most confusing and seemingly dangerous features of the road that one can encounter. These feature drivers going around in circles at relatively high speeds and do not seem to be yielding to other drivers regardless of who has right of way. As it turns it, rotaries, or roundabouts as they are called in Great Britain, can cause problems anywhere. This is especially true when a driver trying to negotiate one of them is drunk. According to a recent news article from Cornwall Live, a mother was allegedly driving drunk with her 19-month-old son when she approached a roundabout at high rate of speed. This was captured on video, and instead of entering the traffic circle and driving around, as she was legally required to do, she drove straight into the roundabout from the edge, and her car rode up the beam and flew 14 feet into the air. At this point, the video showed the car flip over in a scene that looks like something from the “Dukes of Hazard” and came crashing down on the other side of the roundabout. When first responders arrived, they were alarmed to see a child in the car. Fortunately, they were able to pull him out of the wrecked, upside-down vehicle safely. Authorities said the child was very shaken up, but appeared uninjured. He was taken to a local pediatric trauma center to make sure he was okay, as children that age are still very fragile in terms of neurological conditions, but he was later cleared as being okay. When authorities questioned the child’s 32-year-old mother, who was driving the car, she allegedly told officers that she had “probably” been drinking vodka. A district judge told her that she was lucky that someone, including her own child, was not killed, or she would have been facing much more serious criminal charges. As it is, she was sentenced to 12 weeks in a local jail for drinking and driving, and she was sentenced to an additional 14 weeks for what they refer to as dangerous driving. As our Boston drunk driving accident lawyers can explain, this would likely amount to an operation to endanger charge had this occurred in the Commonwealth, and there would also likely be a charge of child endangerment, because her young child was allegedly in the car. While this type of thing does not happen every day, people unfortunately choose to drive while drunk on a regular basis with young children in the car. There are variety of reasons for this. In some cases, it is simply that when someone is very drunk, they have a lessened ability to use sound judgment. However, in many cases, the person is truly an alcoholic that is frequently drunk during all activities of daily living, including driving with a child in the car. It is not known why this woman was driving drunk with her child in the car, but she will not be able to legally drive for three to six years based upon her convictions.